Gluten-free: Substitute tamari or coconut aminos for soy sauce and use gluten-free buns. 1. Finely dice onion and sweet potato. In a large skillet, heat 2 Tbsp of olive oil. 2. Add onion and sweet potato to skillet. Cook over medium-high heat, until sweet potato is soft and onion is translucent (the smaller the dice, the faster they will cook; cover pan to speed up cooking further). Add garlic toward the end. 3. 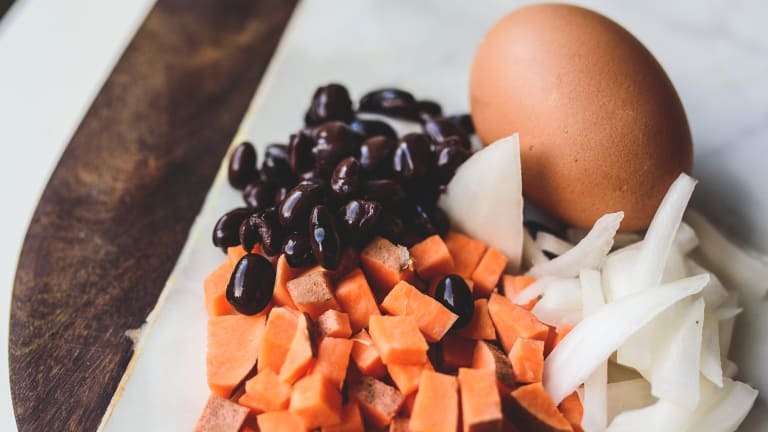 In a large bowl, mash black beans (a potato masher works well for this purpose). Add sweet potato mixture and remaining ingredients. The amount of oats needed will depend on the wetness of the mixture—add more as necessary. The end result should be easy to shape with your hands, but not too dry. 5. Wipe out skillet with a paper towel. Heat 1 Tbsp olive oil in skillet over medium-high heat. Add burgers (in batches, if necessary; do not crowd the pan). Take care when flipping them; they may be a bit fragile. Burgers are finished when browned on both sides and heated through (about 5 minutes on each side). Remove from skillet. 6. Put buns facedown in skillet. When toasted, serve with burgers and your favorite toppings. *They can be cooked from frozen; simply cook over low heat until heated through, then raise heat to brown on both sides.